Immense wildfires are still ripping across southern California this week. This video from what seems to be the cab of a CalTrans plow truck clearing paths firefighters and rescuers is particularly harrowing. The uploader of this tweet identifies themselves as an equipment operator for CalTrans. I reached out for comment, and will update this story if they decide to get in touch. They have shared quite a few disturbing clips from the front lines of some of California’s catastrophic fires. Meanwhile, it’s heartbreaking to see Route 33, once called out by Jalopnik as “America’s greatest driving road,” reduced to this horrifying hellscape. And, of course, to think about all the nearby people and and animals and communities being inundated with fire and smoke. Air quality gets bad before it looks bad. The sky has been blue as far west as Culver City, but even out there the air still smelled like poison last week and official warnings to “minimize time outdoors” were in place over the weekend. So you can imagine that the opaque air this truck is punching through must have smelled and tasted pretty toxic. 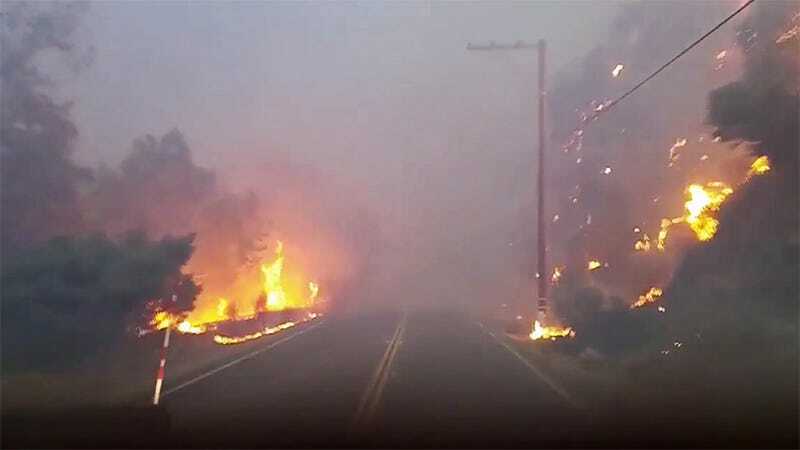 Here’s hoping the collaborative efforts of California’s first responders and infrastructure workers, plus agencies coming in to help from other states, can contain the fire soon and get those in danger to safety.